See the Unseen on the Honor View 20. A groundbreaking Dual 48 megapixel and 3D camera system is a game changer in the world of photography. 4-in-1 superpixels and Artificial Image Stabilization (AIS) allows you to shoot the shot even in the darkest of situations. Real-time video retouching is now available and the 3D camera offers Depth Sensing, Skeletal Tracking, and Real time Motion Capture. It also separates you from the background with multiple retouch levels for the perfect look in any situation. 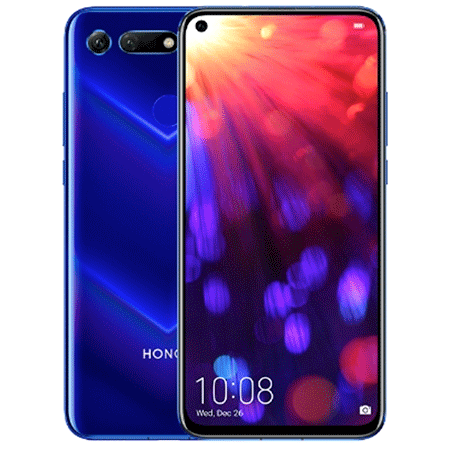 Designed with technology and aesthetics alike, the Honor View 20 is a sight to be seen. The innovative “S-shaped heat pipe“ cools a wide area of heat to guarantee sustained peak gaming performance. Be rid of Low-Battery Anxiety thanks to the Honor View 20 with a 4000mAh battery, +4.5V/5A and HONOR SuperCharge. View Everything Imaginable on the All-View 6.4 inch Display. The notchless narrow-bezel design generates an extremely high screen-to-body ratio allowing you to see the unseen. The full HD 1080 x 2310 6.4" IPS LCD display also houses the 24MP 4.50mm ultra-small in-screen front camera, to provide a power selfie game, without the obtrusive notch. A powerful Kirin 980 AI chipset and breakthrough technologies empower you to see the unseen, while the GPU Turbo 2.0 gives you a full-frame gaming experience. The world’s first 7nm Mobile AI chipset is powered for intelligence and an impressive 8GB/6GB RAM provides a super speedy user experience. The Triple-Antenna Wi-Fi will maintain a strong Wi-Fi signal no matter how you hold your handset.